Your Invisalign treatment will consist of a series of clear, practically invisible aligners that you switch out about every two weeks. Each aligner is individually manufactured with exact calculations to gradually shift your teeth into place. And since your Invisalign system is custom-made for your teeth and your teeth only, with a plan devised by you and Dr. Cross, you know you'll end up with a smile that truly fits. 1. Virtually invisible so no one can tell you're straightening your teeth. 2. Much more comfortable; No wires or brackets; No need for wax to prevent wires from poking gums and cheeks and causing ulcers. 3. Aligners are removable so you can eat without worrying about how much food is getting caught in your metal braces. 4. You can eat anything you want, unlike metal braces. 5. You can brush and floss normally. 6. Because you can keep your teeth cleaner, you do not have the problem of swollen gums and decalcified or decayed teeth as is so often seen with metal braces. Not only is Invisalign versatile, helping to correct a broad range of dental and orthodontic issues, but it really works. And there are over half a million smiles to back that up. But a confident smile isn't the only benefit of correcting your dental issues with custom-made Invisalign aligners—your health can be positively impacted as well. Learn more about several common issues below that Dr. Cross can work with you to correct. Open Bite: Open bite often occurs when some teeth are unable to make physical contact with the opposing teeth for a proper bite. Most often caused by a genetic abnormal jaw structure or excessive thumb-sucking, an open bite can cause poor or painful chewing, and even speech impairment. It can also lead to greater issues like thermo-mandibular joint disorder (TMJ). Dr. Cross will work with you to create a custom-designed program that will treat your specific dental or orthodontic issue(s). Your treatment program will consist of a full set of aligners, made for you, and only you. What are some of the health benefits of Invisalign? Signs of periodontal disease, such as swollen gums and redness, can surface due to teeth that are crowded or too widely spaced. Clinical studies have shown that when teeth are properly aligned, it helps the gums fit tighter around the teeth, which can lead to better periodontal health.¹ Since the Invisalign system’s greatest advantage is its ability to align teeth, your gum health may improve after Invisalign treatment.² And since you can brush and floss normally with Invisalign, unlike with traditional braces, you can more easily prevent tooth decay and related periodontal disease. What is the treatment process and how long does it take? Your treatment plan begins with a consultation with Dr. Cross. During that consultation, you will discuss the options to treat your particular issue. Once Dr. Cross confirms that your issue can be corrected with the Invisalign system, he will write a detailed treatment plan that determines how each of your aligners will change throughout your program. When you begin treatment, you'll wear each set of aligners in approximately two-week increments. The aligners gently move your teeth into position, and at the end of each two-week period, you "graduate" to the next set of custom aligners. As you progress through the series of aligners, your teeth will begin moving, little by little. And you don't have to wait until you complete treatment to see your smile change—you may start seeing positive changes early in the process. You will have occasional checkups with Dr. Cross—often as little as once every four to six weeks—in order to gauge your progress. And at the end of your treatment, you'll be showing off a smile you never knew you'd have before you had Invisalign. So how long will it take to finish your treatment? For most adults, treatment time is just under one year, however, if your case is more difficult it will take longer, just like with regular braces. Of course, your total treatment time depends on your particular situation, so it's important to speak with your doctor about how your situation and goals fit into an Invisalign treatment program. You're in control of your treatment's success. The more you wear your aligners, the better. Take them out to eat, drink, and brush your teeth. But the more you wear your aligners, the better. You're on your way to the smile you've always dreamed of! HOW WILL MY ALIGNERS BE MADE? So what happens when you decide Invisalign is for you? 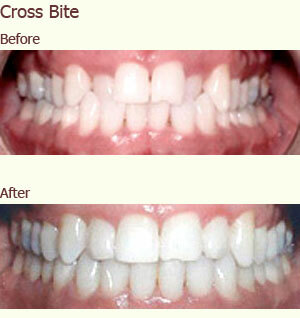 Simply visit Dr. Cross for a consultation to discuss the goals you have for your smile. Once Dr. Cross determines that Invisalign is right for you, he will write up a detailed treatment plan, and a set of virtually invisible aligners will then be sent. Your Invisalign system may look like a simple piece of plastic, but it's much more. With advanced technology, your Invisalign aligners are custom-made for you, and only you. Over time, your teeth should move to reveal the smile you've been looking for. So take a look at the steps you and Dr. Cross will take to get you to a brand-new smile. Your initial consultation with Dr. Cross is easy. During this visit, you'll discuss the issues you have with your teeth and what kind of results you would like to see. Once Dr. Cross decides your situation is suitable for Invisalign treatment, a treatment plan will be mapped out with your goals in mind. Then, impressions and pictures of your teeth will be taken for digitization purposes. The impressions of your teeth will be digitized in order for Dr. Cross to work with a computerized 3-D image of your teeth. Then, he will plan your tooth movements throughout your entire treatment timeline. You'll be able to see a virtual representation of your teeth before, during, and after completion of the Invisalign process so you can see what your smile should look like when you're done with treatment. From Dr. Cross's precise treatment plan, customized aligners are created with advanced technology for you to wear at each stage of your treatment. While the number of aligners varies for each individual situation, a full set of treatment typically includes 20-30 aligners per arch. You should wear your aligners at all times, with the exception of eating and drinking, in order to complete your treatment in the timeline determined. You'll go in for occasional checkups, to monitor your progress and to receive your next set of aligners. During the entire treatment process, you'll be able to watch your teeth gradually moving into place. Your smile will, little by little, move into something you'd like to show off. The people around you will be sure to notice your new-found confidence. Choosing the Invisalign system is a smart decision on your part because the advanced technology provides you with customized treatment to give you a smile that suits you. And even with all that superior technology, we make it easy for you to get Invisalign. Look over some payment options to help you on your way to the smile you've always dreamed of. HOW IS INVISALIGN SIMILAR TO TRADITIONAL BRACES? 1. It takes about the same amount of time; Anywhere from a few months to 2 or more years, but the average is about one year. 2. Each time you put in a new aligner for the first time, there may be a period of soreness for 2 or 3 days, however there is usually not anywhere near as much pain and soreness as is experienced after getting metal braces tightened each month. 3. During the course of treatment, we may have to add small invisible attachments to your teeth and/or do a slight amount of sanding between your teeth to allow them to move easier, just like with regular braces. 4. 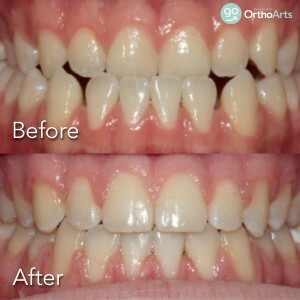 After all originally provided aligners are worn, there may be a period of 1 to 3 months of aligners to perfectly refine the case, just like with regular braces. There is no additional charge for this. 5. Just like with regular braces, after the case is complete, we may need to equilibrate or adjust your bite so your teeth fit together properly. 6. Just like with regular braces, after the case is complete, you will need to wear a retainer in order to keep the teeth from moving back. One set of retainers is included in the fee. Many dental-insurance providers cover orthodontic treatment to some extent. If your dental plan is one of them, Invisalign may qualify as orthodontic treatment. Talk to your insurance provider to determine the extent of coverage for your treatment. Are there financing options with Invisalign? Many companies offer employees Flexible Spending Accounts (FSAs). An FSA allows you to set aside a portion of your paychecks in order to pay for qualified medical expenses. Since Invisalign can fall under orthodontic treatment, these costs can qualify for FSA reimbursement. If your company offers FSA and you know you’d like to treat yourself to Invisalign, plan ahead and consult your benefits department. When it comes time to enroll in your program, you can submit the appropriate amount for your Invisalign treatment and save money while doing it, since it’s a pre-tax contribution. It’s an easy and convenient way to get the smile you want. 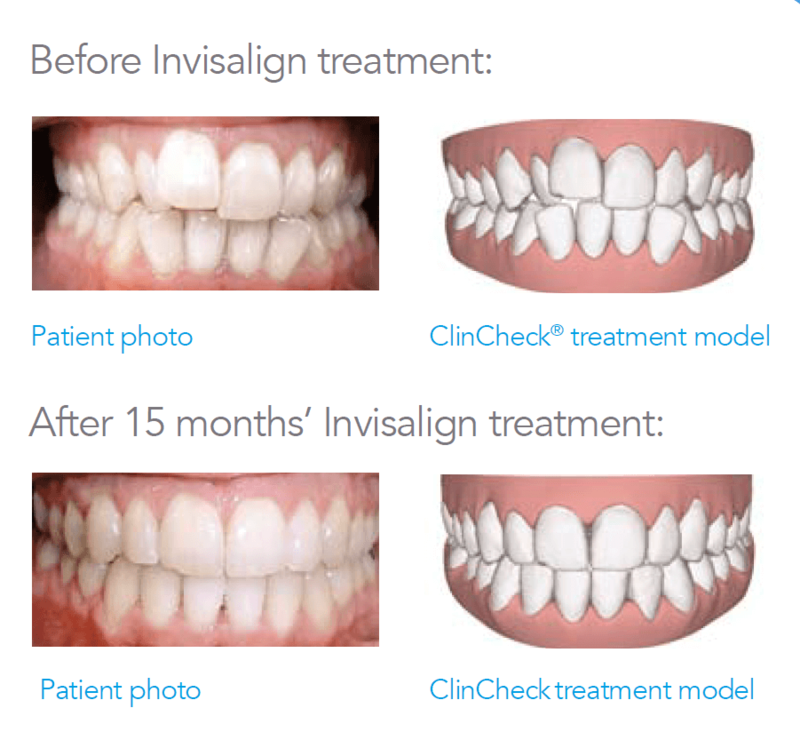 HOW DOES INVISALIGN COMPARE TO OTHER COSMETIC OPTIONS? When it comes to considering your options for a smile makeover, it's easy to see Invisalign's advantages. So there's a reason to smile. Compare Invisalign to other teeth straightening options. While veneers aren't a direct comparison to the Invisalign system, they can still address some of the same cosmetic problems. Getting veneers is considered more of a quick fix than Invisalign, but they have some distinct drawbacks. When you decide on veneers, often, but not always, the front surface of the tooth enamel is permanently removed. Then the veneer, a thin piece of specially-shaped porcelain, is glued over the front of your teeth. This is an irreversible procedure if the tooth enamel is removed to accommodate the veneer. Another problem with veneers is that they are not a permanent solution. They can chip or break, requiring you to replace them on an individual basis, which can get pricey. Even if they don't chip or break, over time they may come off. Veneers tend to last about 5 to 10 years, depending on the quality of the veneers purchased. Since your tooth enamel may have been removed, most patients have no choice but to replace their veneers, incurring the same high costs every time they have to get a new set. Last, but perhaps most important, because veneers are a purely cosmetic treatment, they don't correct health problems of your teeth. Instead of straightening teeth as Invisalign does, a veneer simply covers up imperfections. Invisalign offers you beautiful, healthy teeth—it's a solution worth smiling about! The best way to clean your aligners is by brushing them and rinsing them in cool water. Never use hot water as it may melt the aligners. For the best, quickest results, wear your aligners all day, except when eating, brushing or flossing. How often must I see Dr. Cross? Dr. Cross will schedule regular appointments – it could be anywhere from every four to ten weeks depending upon the difficulty of the case. The goal of these visits are to ensure that your treatment is progressing as planned. Just like with braces you will need to use a retainer to keep your teeth from moving. We use a clear plastic retainer similar to the Invisalign aligner but made of a stronger material so that it will last longer. Align Technology also offers the Vivera Retainer. We know cost is a big question for anyone considering dental or orthodontic work. Invisalign treatment is usually similar to the cost of traditional braces. If you’re concerned about cost, talk to Dr. Cross about payment options and visit our "Patient Financing" page to see how you can get Invisalign with no down payment and easy monthly payments.